Grilled lobster is a culinary treat that is delightful on the grill and even better on the plate. Spiny lobsters are often steamed or grilled in their shells, easy and fast and also easy to over cook and rubbery. This method requires a bit of effort to remove the lobster from the shell and onto skewers but the result is crunchy juicy off the grill. Allow lobster to come to room temperature and remove from shell, or remove the shell from the meat by pulling, tearing or scalpel. Skewer. Try to stay in the center of the meatiest parts. If using bamboo skewers pre-soak them for at least an hour prior to grilling. 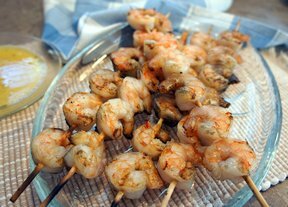 Skewer shrimp as a great supporting cast to the lobster. Brush lobster with olive oil to aid in non-stick. MEDIUM HEAT- 400° F Max, too hot, too fast will be rubbery. For charcoal grills let the coals reach their peak and grill on the downside. Set BGE and other smokers at 350-400° F. Lay the skewer across the GrillGrates on an angle almost vertical. The lobster will take 15-20 minutes turning a couple of times and change the angle to come to horizontal. This allows more surface to come in contact with the GrillGrates during grilling. Give the lobster a 10 minute head start then put the shrimp on. They need less than 10 minutes turning once. The shrimp may come off before the lobster or at the same time- judge by color and firmness.